Leicester scrum-half Ben Youngs has been suspended for one week following a Rugby Football Union disciplinary hearing on Monday. 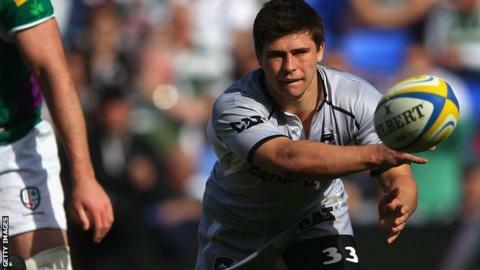 The England half-back was cited for dropping his knee and punching London Irish flanker Jamie Gibson on 25 March. Tigers imposed a club suspension on Youngs prior to the hearing which meant he missed Friday's win over Worcester. The ruling means Youngs, who pleaded guilty to the charge, is clear to play again from 5 April. The Norfolk-born player, who has made 94 appearances for the Welford Road club and scored 85 points, will be free to face Northampton in their crucial Premiership clash on 14 April. The ban was imposed from 28 March, when Leicester imposed their internal suspension, until 4 April. His Honour Judge Jeff Blackett, who chaired the RFU panel, said: "We decided that the offence was at the low end of seriousness, which carries an entry point of three weeks. "There were no aggravating features and on the basis of his good record this was reduced by 50%. "There was a compelling mitigating factor in that the player was being held down unlawfully for a substantial period and so we reduced the suspension further to one week." The same panel dismissed the case against Harlequins flanker Maurie Fa'asavalu for his tackle on Bath fly-half Tom Heathcote. Also, Worcester stand-off Andy Goode will not face further punishment after he was sent off against Leicester in Friday's 43-13 defeat.